My decision to pursue a snowboarding career/lifestyle was filled with highs and lows. Following a bad crash on my board my doctor told me “no more concussions”. It broke my heart to have to throttle back on a sport I loved so much, but it had to be done. I found running as a perfect outlet, due to its low impact and community atmosphere. I started with shorter stuff: 10Ks and Half Marathons, running in minimalist shoes, until that became boring. Around that time I heard about this tribe in Mexico, called the Raramuri or Tarahumara, they were supposed to be some of the best, most “super human” runners in the world. I was told they ran huge distances in sandals made of tires, just as part of their life. I picked up a tire one day, carved up a pair of sandals and went for a run. I did a little research on the tribe and found a book called “Born to Run”. After reading the book, I found myself toeing the starting line of the Copper Canyon Ultra Marathon in Urique, Mexico, my first ultra. The Copper Canyon experience was one of the most important, influential moments of my life. I was able to run with these people who didn’t only run for fun, but as a necessary part of life. But they were no “super humans”, they were no different than you or me. Just people living their life, and enjoying the beautiful earth we are all a part of. Now I find myself in love with running. Running to me is so much more than just getting from point A to point B, its more about the journey, the places I go and the people I meet, the self discovery. It makes me feel free, and takes me away from the unnecessary thoughts and distractions of the modern world, bringing me back to a pure way of living and enjoying the beauty of everything the earth has to offer. 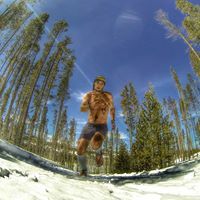 Q- Why barefoot running, even for such long distances? 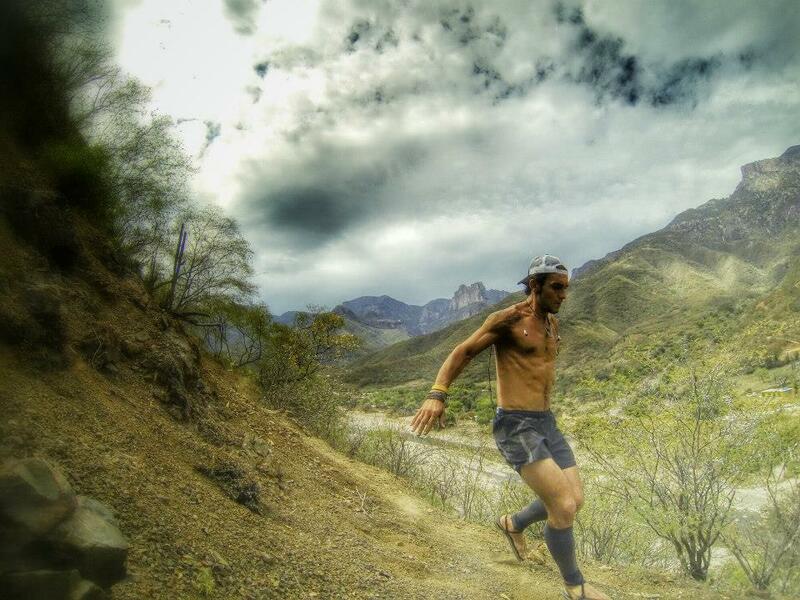 I currently run in Luna Sandals, this footwear helps my feet perform in a more primal way, helping me stay connected with the earth and the trail below. The earth has moods just as we do, whether its snow or sun or rain, no matter her mood it is our job to bring her up when she’s feeling down or to enjoy the green grass and colorful flowers as the sun warms our shared love for one another. I don’t see myself as a role model, but more as someone who made the mistakes but learned from them. My motivation stems from my past, it drives me in a direction that’s much more positive and when you’ve seen the lowest point the only direction to go is up. You never regret the things you’ve done, only the things you didn’t, so grab onto every opportunity because you never know where it will take you. Q- What forms of cross-training do you do, as in Yoga, strength work, and do you do any meditation/ mindset/ spiritual practices, to assist your running form? As far as cross training goes, I rarely find myself in the gym, instead I try to do at least one hour of yoga a day, followed by meditation and breathing exercises, to assist in clearing my mind. Ultra marathon running is a very mental sport and having clear, pure thoughts helps keep you focused on the goal. Somedays when I am out for my runs I climb trees and swing from branches. As far as weight training goes, I carry logs and rocks around the forest to help stay strong. Q- What does a typical day of training/ running look like? A typical running day consists of me waking at 4:30 am and going out for a long run in the mountains directly behind my house (which some days is me wading through waist deep snow and battling temperatures of -10 F). I will run for a few hours and then head to work for 6 or 7 hours (at a sporting goods consignment store). Then I will head out for another hour or two run, before heading into my other job (as a chef) for an additional 8 hours. After that I will head out for yet another run around midnight. I usually don’t get to bed until 1 or 2 in the morning and I do it all over again the next day. I basically use any excuse to get out and do what I am passionate about, whenever I have a chance. Q- Do you take days off from training? If so, what does a typical rest day look like? If I take a day off it will usually consist of me sleeping in, working all day at both of my jobs and practicing yoga in a steam room or sauna and maybe finding a hot tub to soak in. Q- What do you typically eat/ what kind of diet do you follow on a typical day? Any specific dietary fitness tips? I have been eating a vegan diet for about 4 years, eating clean and pure makes my body work much more efficiently. Getting all my nutrition from natural sources make me feel so much more energetic and alive, also making feel more connected to the source. Leafy greens and Quinoa are huge parts of my diet, giving me necessary protein and vitamins that otherwise would be missed. Q- Having accomplished 100 miles in under 24 hours, where do you go from there? Do you have any further ambitions? After the first time I ran 100 miles I realized that it wasn’t horrible and I was able to cover this distance with a little patience. Knowing this I am now able to see some of the most beautiful place in the world and am able to do something I love for such a long period of time. I am signed up for six more 100 mile races this year so I will be able to see how far I can push my spirit. In the future I would like to get faster at this distance and maybe sign up for 72 hour race. (A race where you get to see how many miles you can run over 3 days). Q- Do you think running this much is ‘healthy’? Or could it be an unhealthy adrenalin addiction? I don’t think it is unhealthy, I also don’t think its an addiction. I feel like you need to put the time in, to make your running the best it can be. But I also feel like its a habitual kind of thing, like brushing your teeth. If you get up in the morning and forget to brush your teeth, your day will be a little off. If you don’t go for your run at some during the day, you might be a little off. Our bodies are strong beautiful things, we can push through pain, but we know when to stop, and when to say when. Endorphins are great motivators to get you through a race, but an addiction? No way. Q- What are your upcoming race plans? Well it all starts at a 50K race in Michigan on April 27th, then I head to California for the Miwok 100K on May 3rd. After that I am cruising down to Los Alivos, California for the Born to Run 100 miler, which is probably the most fun race of the season. When I finish that race I will be heading up to Agua Dulce, CA to begin 630+ miles of running and hiking on the Pacific Crest Trail, to enjoy all the beauty California has to offer. Once completed, I will be camping and playing around Lake Tahoe, CA, for a month and a half, preparing for the Tahoe Rim Trail 100 miler. From there I head to Leadville CO for the Leadville Trail 100 in August. After that I head down to Silverton Colorado for another 100. Then to Michigan to crew and pace for my sister Toni Reese at her first 100. I take a few days off then head to Oregon for the Pine to Palm 100 Miler. And finally, rounding out the season in Arizona with Canyon De Chelly 50K and the Javelina Jundred (100 mile). Once November hits it is anyone guess where I will be and what I’ll be doing. As long as I am smiling by the end of it, I will be very satisfied. Q- What advice do you have for someone interested in running an ultra-marathon? A lot of people come to me and say how they think it would be impossible to run an ultra, well my advice to them is to get out there and try! Because even if you don’t finish, along the way you’ll meet some of the most beautiful people, and have a fantastic experience that WILL change your life. Be humble, be kind and one day with much patience, and hard work amazing things will happen. Just trust yourself, live with an open mind and heart. Oh yeah… and don’t forget to RUN FREE! Training is boring, running free is amazing. Q- Finally Tyler, I asked you to do this interview, as I found you to be a highly inspiring human and thought others might be inspired by you too. What were your reasons for agreeing to share your story this way? My life has been a long bumpy road, and sometimes an uphill battle, but I am pretty satisfied with the direction that it is heading in now. If I can help one person with their running, or inspire them through what I do, I will consider my life a success.